3, 2, 1, Blast Off with Hearts In Action! 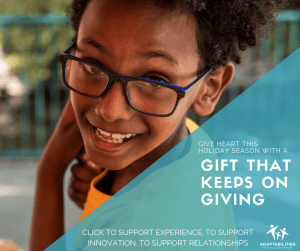 By now, you’ve heard a friendly AdaptAbilities employee tell you excitedly about our upcoming Hearts In Action summer camps, or perhaps your child is friends with an alumni camper, thrilled to return! It’s hard to believe another summer is upon us, and we are looking forward to another year of growth, success, and community inclusion! Let’s talk a little more about our summer camps. Make new friends. At AdaptAbilities, we believe every child has the right to grow, succeed and belong. At HIA, campers have the opportunity to connect and interact with new friends in a supportive and inclusive environment. Learn while having fun. Our team engrains educational components and learning moments into every themed camp that can be incorporated into real-life experiences, year-round. No day is the same. This year, HIA is launching themed camps. From Olympics to Whimsical Wizards to Wilderness Wonders, our camps are engaging and interactive to keep your campers engaged and excited! You can look forward to themed field trips, crafts, and games each week. All campers receive a free camp t-shirt. Campers will also receive a limited edition summer swag item – stay tuned for it’s release! Registration is open and spots are filling fast! Camps begin on July 3 and continue until August 31. If you are interested in having your child or young adult participate, register here. We hope you will join us for a summer of fun! 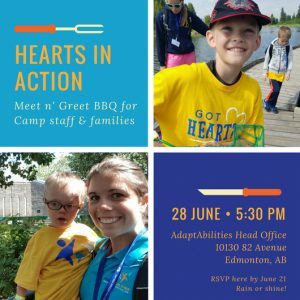 We will be kicking off HIA at our Annual BBQ on June 28 at 5:30 p.m. at our main office located at 10130 82 Avenue NW in Edmonton. This is a great opportunity to meet your fellow campers, and talk to the staff supporting your child this summer! Our aim is to provide you with peace of mind – and to provide your camper with a summer they will never forget! Click the invite to RSVP! Contact us directly today and our team would be more than happy to assist in answering your HIA and any other programming questions. From the entire team at AdaptAbilities, we wish you all a wonderful summer! Thanks to you! Help AdaptAbilities Win $7,000!